A hot tub cover is a very important piece of equipment. 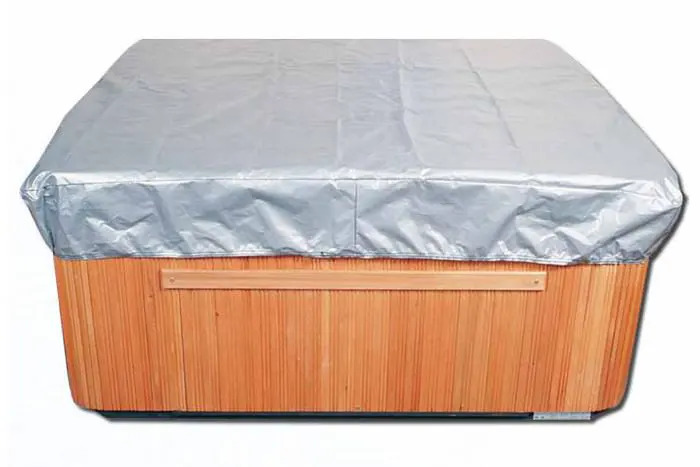 The cover protects your hot tub from unwanted debris, harsh weather conditions and backyard animals. Covers also help you save on energy costs by keeping the heat inside your hot tub when you aren’t soaking in it. Hot tub covers are a necessity for all hot tub owners and can be a costly purchase. This is why you will want to make sure that you take the appropriate measures to maintain your cover for as long as possible. If you neglect your spa cover it will most likely deteriorate and lose its effectiveness very quickly. Pin this for later > This infographic illustrates important guidelines for hot tub cover care that will help save you money and keep your cover in working condition. The maintenance of a hot tub cover is minimal. 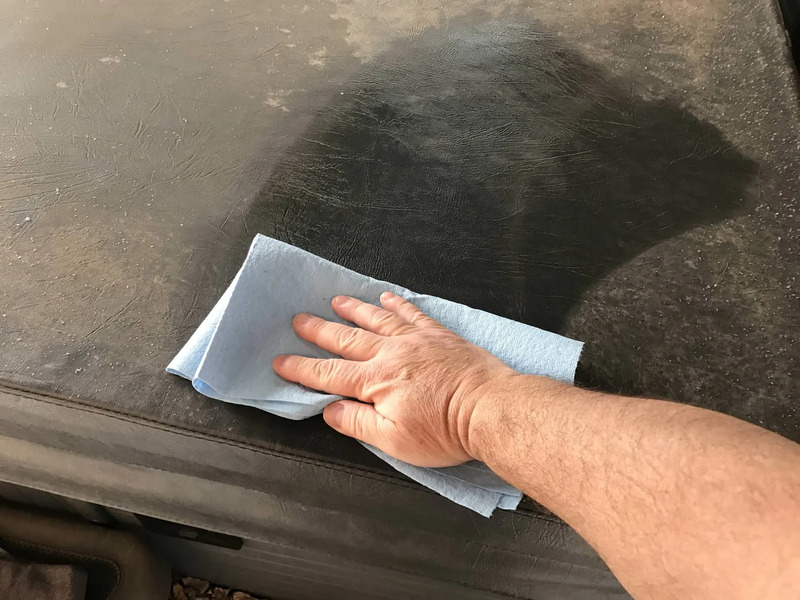 All you have to do to is clean it thoroughly once in a while, frequently remove debris from the top of your cover and fix scratches and tears before they become a problem. First, you have to remember to always remove any debris from your cover such as leaves, branches, snow and ice as soon as possible. Then, rinse, wipe down and condition your cover. The rinsing is for removing dust off the surface and it can be done with a common garden hose. I recommend doing it every 2 weeks or whenever you feel like your cover needs it. Once the cover has been rinsed, wipe it down with a cleaner specially designed for hot tub covers. Some regular vinyl cleaners can cause a lot of damage to the vinyl of a hot tub cover. Finally, once all the vinyl surfaces have been rinsed and wiped down, apply a protectant. A protectant is a special treatment that makes your hot tub cover resistant to dirt and dust, and also protects it from UV damage, which can cause discoloration and cracking of the vinyl over time. While you’re cleaning, don’t neglect the underside of your cover. The top of the cover has to contend with the elements. The bottom has to stand up to constant exposure to heat, moisture and water treatment chemicals. While you are cleaning the cover, also wipe down the plastic underside with a 10% bleach solution (1 part bleach, 9 parts water). Remember to first take the cover off the tub. Once the cleaning is done, you can easily inspect your hot tub cover. Rips and tears will allow water to penetrate the cover, so you better fix them as soon as you see one. Furthermore, once a year or so, you should take the foam core out of the vinyl and do a more thorough check. If you find any holes or breaks in the vinyl, they can usually be patched with a vinyl repair kit. While the foam is out, check it over carefully. The foam is wrapped in a plastic moisture barrier that prevents it from soaking up water. If you find any holes or tears in the plastic membrane, the barrier won’t work properly. These can also be repaired. Wiping the plastic down with a 10% bleach solution is also a good way to prevent mildew buildup inside your cover. You think your cover might be in for a change? Check out this article for more information on when to change your hot tub cover and what to look for in a new hot tub cover. 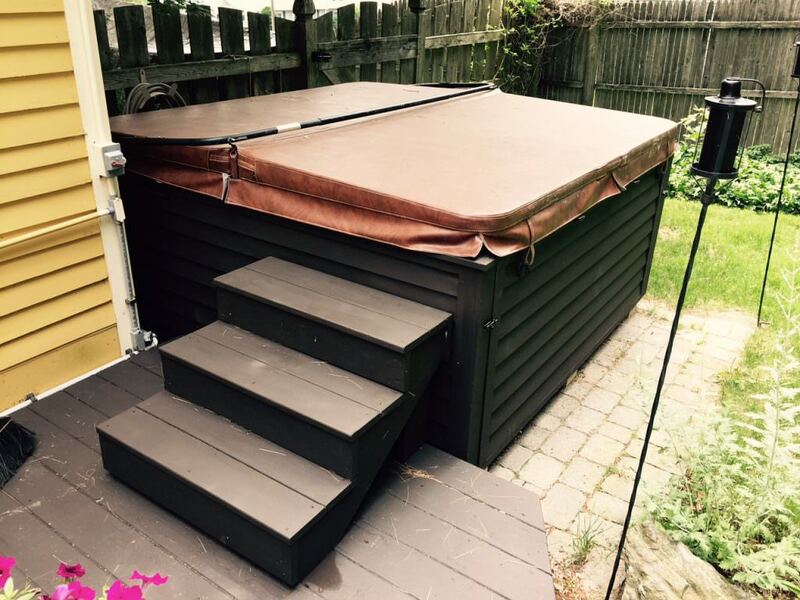 One of the best things you can actively do to extend the life of your hot tub cover, is to take it off regularly. This allows the vapors to dissipate before they can become strong enough to damage your cover. In the gap between your cover and the surface of the water, there is a layer of warm humid air. That air is filled with chemical gases from the tub. Chemical products are the single most common cause of hot tub cover damage. Once a week or so, and every time you shock your tub, leave the cover off your hot tub for at least an hour. If you use your hot tub weekly, then you won’t need to do this. Stick to your maintenance plan : don’t use more chemicals than necessary. Once in a while, flip the foam inside of your cover like you would a mattress. Use a hot tub cover lifter. Use a hot tub cover cap. Regular cleaning and conditioning of the hot tub cover is very important for the longevity of your cover. Cleaning will help the materials resist the ravages of time and weather. Debris such as leaves, branches and snow need to be cleared off as they build up. If you don’t remove debris, it tends to rot and develop mildew.